Time for window shopping? Get ready for the product that was absolutely made for the kitchen table sales pitch. Windows are a salesperson's dream, chock full of parts and pieces that can be handed to the homeowner, moving sashes to display operation, and a light kit to show the effectiveness of the new glass, featuring a heat lamp powerful enough to singe your corneas! Early in my career, a sales manager once told me, "You sell the sizzle, not the steak." Windows certainly have a lot of "sizzle" terms that sound pretty impressive, like Constant Force Balancer, Block and Tackle, Low E, Argon Gas, Krypton Gas, Triple-Fin Nylon Pile Weatherstrip, Warm-Edge Spacer, Neat Glass, Fusion Welded Corners, the list goes on and on... Let's navigate around this "sizzle" and see what actually makes a good "steak" when replacing your windows. If you decided not to use My 3 Quotes (bad idea) and you are on your third 3-hour window presentation with all of these terms swimming around in your head, how do you know which features are the most important? The one measuring stick that cuts through all of the subterfuge is the window's U-factor. U-factor measures the amount of heat transfer, which tells you how well the window insulates. The lower the number, the better. A U-factor of .30 or less was required on the last round of window tax credits and that is the minimum I would recommend in our Minnesota climate, however, .35 is the minimum Minnesota Energy Code requirement. 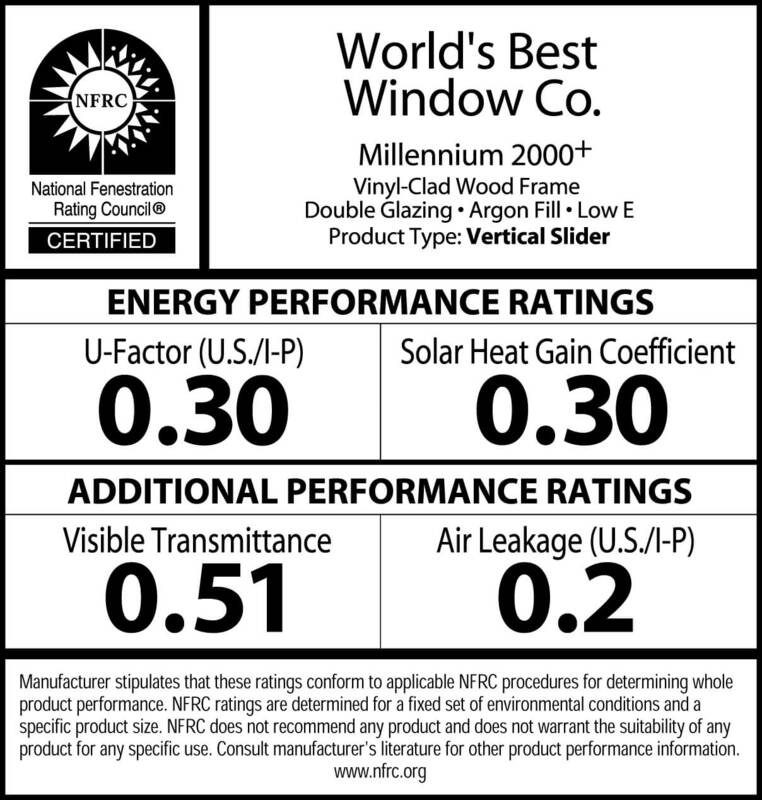 Ask for the NFRC sticker verifying the window's U-factor from your contractor. The NFRC is the National Fenestration Rating Council. For those of you who would like to learn a new word, "fenestration" is a term that means "the openings in the walls of a structure." Those openings get filled with windows and doors, thus the NFRC rates windows and doors. Got it? Good. So, if one window has a U-factor of .27 and the other is .34, the .27 is significantly better. But what if the .34 window has "triple fin nylon pile weatherstrip?" It doesn't matter what amazing bells and whistles that window has; it's not as good in the efficiency department, which is one of the main reasons we replace our windows. 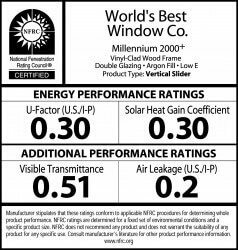 DECEPTIVE MARKETING WARNING: Some windows have brochures showing windows with really low U-factors, but when you read the fine print, it says that the U-factor is being measured from the center of the glass. The full unit U-factor is the only one that matters, so if a salesperson tells you their double pane window has a U-factor of .23, ask them, "Is that full unit or center of the glass?" The salesperson will then know they are dealing with an educated homeowner that they can't B.S. Tell them what "fenestration" means and they may run out the door! The glass pack is not the only factor that determines U-factor, but it certainly is the biggest. Most glass packs are double pane, with an air space of anywhere from 1/2" to 1". The panes are attached to each other with a "spacer" that runs around the perimeter, and it is a topic of much discussion in a window presentation. The first spacers were all aluminum and if you have wood windows from the 70's or 80's, chances are you will see the silver aluminum between the glass panes. 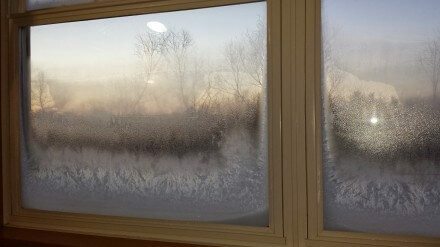 Aluminum is a huge conductor of heat and cold, so it contributes to the condensation that forms on a window in the winter, especially on the bottom edge where the moisture starts to turn the wood black. No window can completely eliminate condensation in a humid house, but the aluminum spacer makes it that much worse. Today there are warm-edge spacers, made out of non-conductive foam polymers. This greatly decreases the heat (and cold) transfer along the edges of the glass, cutting down on the amount of condensation. However, keep in mind that new windows sometimes cause condensation for the first time! How can that be? It's because the old windows were so drafty that the moisture simply passed through to the outside. With the tight seals from a new install and new windows, the moisture is better sealed in your house and will condense on the coolest surface, being the glass. You will get less of it with the warm-edge spacer. If you can lower humidity levels in your home, that will also help with the condensation issue. The other technology that cuts down dramatically on heat transfer and condensation are Low E coatings and Argon gas. Yes, better weatherstripping and improving on the window's draftiness has helped as well. However, the majority of your window is glass, and Low E/Argon filled windows have the most dramatic effect on your windows' efficiency and your energy bills. The '70s, '80s, and most '90s windows simply had two panes of clear glass which is really not much better than a single pane unit with a storm window on the outside. That, along with the aluminum spacer, is why the wood around the glass decayed so quickly. Argon gas is a very heavy gas that goes between the two panes of glass, making heat transfer even harder. If your house was filled with argon gas, you could walk but it would be like walking through water. Heat transfer requires the molecules between your glass panes to become excited and start spinning around, and the heavy gas makes that more difficult. Krypton gas is also available and even heavier, but it is quite a bit more expensive. In case any arch enemies of Superman are wondering, Kryptonite is not available. Triple pane windows with Kryton gas can get a window down to a .19 U-factor in some cases. I'm not a huge fan of triple pane because of the extra weight that strains the hardware and the extra opportunity for seal failure. When a glass pack's seal is broken, condensation forms between the panes of glass and you can't get to it to clean it off. However, most glass packs are guaranteed for at least 20 years so if you want to pay the extra for triple pane to get the lowest U-factor, you sure can. For my money, using a double pane window with Low E 366 from Cardinal Glass (which is available through many manufacturers) gives you nearly triple-pane efficiency. Watch the heat lamp demo below (every salesperson's favorite part of the pitch) to see how much better your new windows will perform over your old ones. Every company does some variation of this in your house. This concludes part 1. In the blogs ahead, we'll talk about the different materials windows are made of; wood, aluminum, vinyl, fiberglass, composite, etc... We'll differentiate between retrofit installs and full frame replacements, and we'll talk about the BIG 3 window manufacturers (Andersen, Marvin, and Pella) and how they differ from their thousands of competitors. What's in a name? Stay tuned! Author: Ryan Carey has 15 years of experience in exterior remodeling for Twin Cities Homeowners and Property Management Companies. He is the owner of “My 3 Quotes,” a company that provides the free service of collecting 3 competitive home improvement bids for customers. For more information, visit www.getmy3quotes.com for free home improvement estimates.